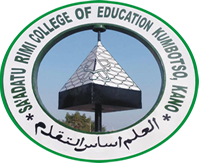 Sa’Adatu Rimi College of Education, Kano Admission Screening Exercise Schedule for all UTME NCE Programmes Applicants, 2018/2019 Academic Session. This is to inform all NCE applicants of the Sa’Adatu Rimi College of Education, Kano that the screening exercise schedule for 2018/2019 academic session has been announced. All applicants with JAMB that applied for NCE programme are expected to come along with all their credentials for screening from 14 NOV - 31 NOV 2018 at Academic office.